Yesterday Mark Gurman of Bloomberg reported that sources tell him Apple is planning to create a unified app architecture that works across macOS and iOS, and that it ties into a bid to develop an Apple computer with an Apple-designed CPU inside. Your Apple apps will be cross-platform, and the line between iOS and macOS could blur to the point that it will be difficult to distinguish between the two. You’ve heard this rumour before. And you’re going to keep hearing it, both filtering out of Cupertino, and from Apple fans—because it’s a damn good idea. First, it’s smart business. As Gurman notes, Apple is hoping to streamline the app development processes as a way of generating more revenue. The app platform on macOS is underdeveloped, but if app developers can build one app and push it to both the iOS and macOS app store that means potentially a lot more customers, which means a lot more revenue for Apple—a company that increasingly finds itself dependent on the money it makes from services (one of the many reasons it’s rumoured to be launching a TV service and a news service this year). But this rumour about a unified app architecture is also shockingly persistent, and repeatedly ignored or denied by Apple. Just last year, Craig Federighi stood on stage at Apple’s World Wide Developer Conference (WWDC) and told a room full of reporters, developers, and fans that Apple was not going to merge iOS and macOS. He emphasised this with the word “No.” in giant white text. He then immediately followed it up with an explanation of Marzipan. That’s the internal code name for this unified app architecture. For Federighi and Apple, there is a distinction between rumours of the merging of the two operating systems and the creation of a unified app architecture that allows developers to create one app that works across all the Apple platforms. At the time the rumours were cause for consternation. Ahead of Apple’s 2018 developer conference, it appeared to be putting a lot of work into iOS, and there was concern that all that work, and this persistent rumour of a merging of apps, would lead to the slow death of macOS. That would be bad. macOS is intended for more professional uses. It works with the powerful x86 processor chips that run your laptop, and most Windows laptops too. x86 processors tend to be faster and better capable of handling big workloads, like video processing, and game streaming, far better than the chips found in devices running iOS. Replacing it wholesale with iOS would be catastrophic. I tried using the new iPad Pro as a laptop last year, using its latest laptop-like features, including plugging it into a monitor via USB-C. The experience was a painful reminder of how useless the operating system is for more sophisticated applications. It’s not ready to replace macOS, and it shouldn’t. 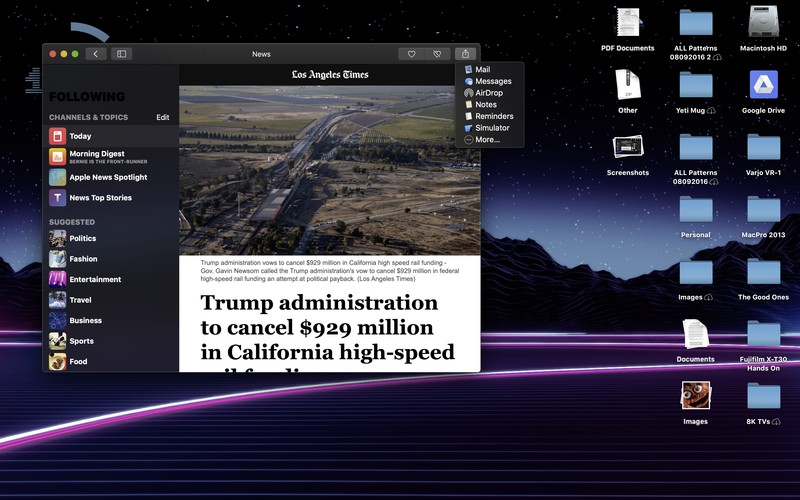 But its apps making their way to macOS, ideally in a form optimised for mouse and keyboard input, and the wider displays of macOS devices, is potentially a good idea. Some of the apps have already made the switch. Though they’re certainly a mixed bag. Voice Memo might be perfect on the Mac, but Apple News and Home, are buggy and ugly. When I open a news source in Apple News on the Mac, I’m stuck in Apple News itself. There’s no way to copy the link so I can share it with people via Slack, or even a way to push the article to my browser. The only way I can share the article is via Mail, Notes, or something like the Messages app. A messy and kludged way around a problem Apple created. It reminds me a lot of when Google pulled a similar tactic, porting Android apps to the Google Chrome OS. When we first tried it out, most Android apps were so slow and buggy they were better off uninstalled. These are stop gaps. They are inelegant ports of mobile apps to desktop-based operating systems. Google has slowly improved its own ports, but its clear making apps work perfectly across Chrome and Android takes a lot of work. Apple, with Marzipan, seems to want to avoid the pitfalls Google’s stumbled into. Thus a unified architecture that should ideally remove all the guesswork for app developers. According to Bloomberg, this project will be complete, and ready for nascent developers eager to step foot into other parts of Apple’s ecosystem, by 2021. In the interim, we’ll likely see more experiments from Apple itself. Like that other persistent rumour touted by Bloomberg: That Apple is developing a laptop, to be released in 2020, that’s powered by an Apple processor instead of an Intel one. Credence was added to this rumour when Tim Cook spent a better chunk of the 2018 iPhone and iPad events touting the impressive design of Apple’s CPUs. He even made the bold, and impossible to test, claim that Apple’s newest CPUs were faster than anything Intel is putting out for laptops right now. It’s impossible to test because there aren’t any apps, like Premiere or Blender, available on the iPad. You can’t simply run the same process on a MacBook Pro and an iPad and know which is faster at performing processor intensive tasks. There’s also the fact that Apple’s processors use a different instruction set than Intel. Intel is based on x86—the same instruction set used on AMD’s Ryzen processors. Apple’s instruction set is based on ARM—the same one used by Qualcomm’s Snapdragon processors. macOS and its apps currently only support x86. iOS and its apps currently on support ARM. Building a laptop, running macOS and an ARM-based Apple processor means macOS will suddenly have to support ARM. One easy way to do that would be to lean into initiatives like Marzipan. And it can’t just be Apple itself leaning into Marzipan. It’s going to need the support of key partners who’s apps are completely dependent on software acceleration that’s based on the x86 architecture, like Adobe. Adobe’s professional apps didn’t make the journey to iOS for so long because so much of what they do is dependent on those x86 CPUs. It’s probably not a coincidence that Adobe is testing the ARM waters this year with a full version of Photoshop on the iPad. Given what we’ve seen from Apple and Adobe: Marzipan, the processors that are supposed to be faster than anything Intel or AMD are doing, additional software acceleration for ARM, it seems clear that Marzipan, and ARM-based laptops, are coming from Apple in the next couple of years. But will this lead to a merging of iOS and macOS? Probably not—iOS is fundamentally a touch-based OS, and macOS is fundamentally a mouse-based OS. Merging the two isn’t as easy as making apps that support both operating systems. It’s about changing the very core of how one or the other operating system would operate, and it’s something Microsoft fell flat on its face attempting with Windows 8, and something Google has struggled with in respect to Chrome and Android. This isn't easy. Convincing partners to support multiple CPU instruction sets so apps can work across platforms might be a lot easier for Apple than demanding its already taxed designers and engineers tackle a problem even its chief competitors have had issues with. I don’t know about you, but I’m okay with that. I’m content to have my iOS and macOS be different beasts. I don’t want a rehash of Windows 8. But getting my favourite macOS apps on an iPad sounds appealing.